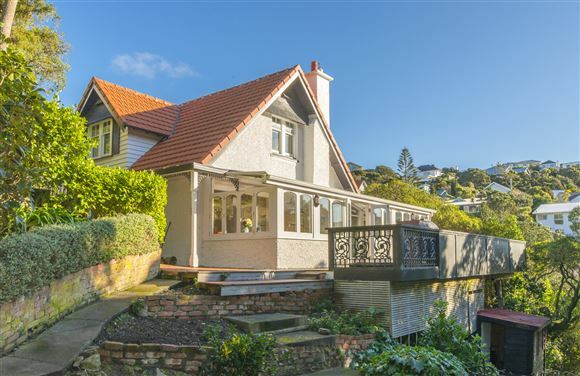 In the heart of Wadestown, nestled privately in its own garden wonderland, is this five bedroom character home which receives fabulous sun and has views over roof tops to the west. Crafted by one of this city's most admired architects, it shows the hallmark of Frederick de Jersey Clere. Great thought and design went into creating this gorgeous garden with its many nooks and crannies, and different levels of lawn which provides a playground for your children and their friends. The indoor-outdoor flow to a spacious deck allows you to entertain with ease. From the moment you enter this gracious home you will appreciate the rich timbers and spacious rooms which all combine to create such a wonderful family atmosphere. From the foyer you can go directly into the large lounge, where many a party has been held or to the right, into a modern new designer kitchen with granite bench top and "chef's" oven. This L-shaped room connects to the dining area and long family room which is a modern-day conservatory type room with wonderful double glazed windows running the length of the room. This is the hub of the house with all day sun pouring in, beautiful stained floor and wide doors opening to the full length deck. This deck, then steps down to a sheltered patio and spa pool on the western side of the house where you can relax in the last of the evening sun. The main bedroom with ensuite, and second double bedroom and bathroom are also on the ground level while the remaining three bedrooms and third bathroom are upstairs. The fifth smaller bedroom could easily be used as an office. This property extends over 1138sqm so you can imagine how your children will adore their outdoor playground with its meandering paths, established trees and levelled lawns. Garage is on street level and access is a path down.